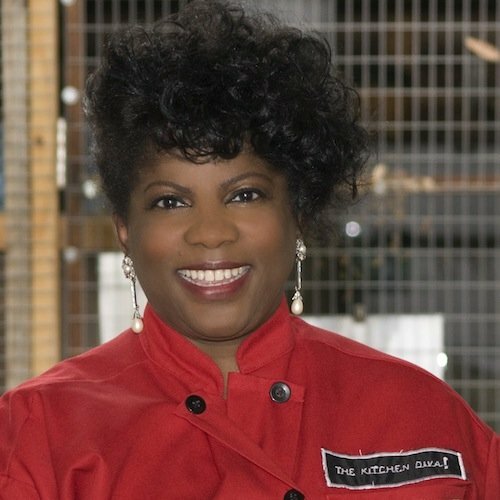 Angela Shelf Medearis is a television chef known as The Kitchen Diva! Medearis is a regular guest chef on Dr. Oz and the TODAY Show and appears on national television shows to create segments, provide cooking demos and provide lifestyle, design, entertainment and relationship advice. Medearis is the founder and president of Book Boosters, Inc. and of Diva Productions, Inc. She is an award-winning children's book author, prolific cookbook author, culinary historian and proud wife to Michael Medaris, whom she lives with in Austin, Texas. I'm 56, so I started out watching Julia Child on black and white television. She would come in on Sundays, and my mom made a huge dinner, and then everyone would go into a food coma except for me, and I would go watch Julia Child. I [also] watched Graham Kerr in the daytimes in the summer. I just liked the passion they had for cooking and their personalities. I had no interest in cooking until about seven years ago. I've really been blessed to have a fabulous career in the limited time I've been doing this. Vertamae Smart-Grosvenor, one of the first African Americans to have a show on national television, [was also inspirational to me]. She had a food related show on National Public Radio for years, and she was on the American family table show for two years. She did a very memorable guest appearance where she brought in a watermelon, which was so stereotypical. She actually had to walk down the street with it in New York. She pretty much took a shotgun and blew that [stereotype] up. Everybody you talk to has a Vertamae story that knows her. She was very inspirational to me. She wrote a book called Vibration Cooking, it's hysterical, it's funny, it's honest. It's not a cookbook that you can use if you don't know how to cook. [It is] her talking about how food was her passport from growing up in this little, bity town in the south to going to Paris. It instantly connects with everybody. I dedicated my book to [Vertamae]. [I admire] people who had a passion for cooking and weren't afraid to take risks. [Vertamae] loves the cuisine she grew up with, anything that had an African connection to it. That inspired me as a writer and as a person who loves history, particularly my own culture's history, but it didn't translate to me actually wanting to cook until about 2004, and that's when I really got serious about cooking. Before then I was a children's author. [I love] the way you can use food as an expression of who you are. I want to have the same impact [as Vertamae] on some little girl who's watching me cook in her living room. I hope to be as informative as my role models about a history that needs to be celebrated. There is no race with food, if someone cooks something for you, you feel loved. I have just passionately fallen in love with all things culinary. I'm so glad I get an opportunity to introduce others to African and African American cuisine. There's a whole lot of stereotypical craziness that you have to address, even if they don't ask you, it's reflected in the articles that are published. If people feel like African American cuisine is unhealthy, that's not true. Most people think we fry things, and they have no idea. I'm always glad I have my background as a culinary historian [because] I can combine it with a basic part of cooking. It's not just barbeque and fried chicken and grains and corn bread. Thomas Jefferson and George Washington had African American chefs-- this has always been something I feel needs to be expressed. That's not the industry your parents would want you to go into because from the time of emancipation until the 60s, that was all you could find, so it wasn't really a celebrated profession. It's just part of our past that was not an aspirational career, so we were not being guided toward that. Nobody wanted to do that. So that's part of the reason. The other part is because of the basic stereotypical prejudice there is about African and African American cuisine-- most restaurant chefs don't consider African and African foods that should be recognized. We haven't had the same sort of champions as other cuisines; you can find almost any sort of cuisine represented on television [except for African and African American]. It's incredibly limited considering the contributions made by Africans and African American chefs. It's incredibly difficult to try to get on television and that's key. It's media presence. 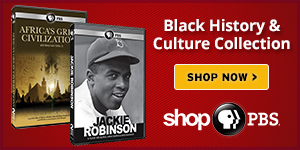 It's incredibly difficult to [broadcast] African and African American food that's representative of us. My husband said, "Now I know why there's not more [representation]-- it's expensive and there's a 24/7 time commitment." We were fortunate that we had made a really good living as children's authors so that we had our own resources. It's exhausting. Even though it is, I still fell in love with it. I still love teaching people about my culture and the connection between certain dishes. Having someone day in and day out [on television] in your living room that looks like you, that's one of the best ways to raise the profile. To have a role model, to have an example, it's hard to dream about something if you've never seen anyone do it. The more that's celebrated, the more you'll find people wanting to study and pursue that. They aren't teaching African and African American recipes in culinary school. If you're studying in an institution that isn't teaching that, your opinion of it isn't going to be that high. There just kind of has to be a change of mind in the way our culture and cuisine is viewed. The Kitchen Diva, a.k.a. Angela Shelf Medearis, is one of 15 culinary insiders that we interviewed as part of a special feature on Black chefs. We identified four themes that surfaced across many of their responses and in our research. Did you notice any? Select a theme to learn more.